[S6] G.E. Cokayne; with Vicary Gibbs, H.A. Doubleday, Geoffrey H. White, Duncan Warrand and Lord Howard de Walden, editors, The Complete Peerage of England, Scotland, Ireland, Great Britain and the United Kingdom, Extant, Extinct or Dormant, new ed., 13 volumes in 14 (1910-1959; reprint in 6 volumes, Gloucester, U.K.: Alan Sutton Publishing, 2000), volume I, page 309. Hereinafter cited as The Complete Peerage. [S6] Cokayne, and others, The Complete Peerage, volume I, page 309. [S6] G.E. Cokayne; with Vicary Gibbs, H.A. Doubleday, Geoffrey H. White, Duncan Warrand and Lord Howard de Walden, editors, The Complete Peerage of England, Scotland, Ireland, Great Britain and the United Kingdom, Extant, Extinct or Dormant, new ed., 13 volumes in 14 (1910-1959; reprint in 6 volumes, Gloucester, U.K.: Alan Sutton Publishing, 2000), volume XI, page 548. Hereinafter cited as The Complete Peerage. [S6] Cokayne, and others, The Complete Peerage, volume XI, page 548. After her marriage, Lady Lucy Percy was styled as Baroness Hay of Sawley on 6 November 1617. From 6 November 1617, her married name became Hay. After her marriage, Lady Lucy Percy was styled as Viscountess Doncaster on 5 July 1618. 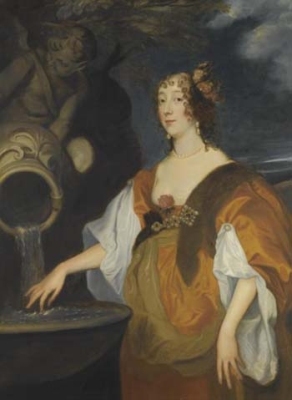 After her marriage, Lady Lucy Percy was styled as Countess of Carlisle on 13 September 1622.1 Witty and beautiful, she was the friend of Stafford, and, after his fall, played an intricate game of intrigue, which in 1649 brought her for some months to the Tower. Her married name became Buller.